John Belushi. Dan Ackroyd. John Candy. Cab Calloway. James Brown. Carrie Fisher. Ray Charles. Aretha Franklin. Comedy. 01 Ade tastics. 01 Nigel's Choice. Cult. Chases; Cars, buses, etc. Music. Ben's Faves. 01 Adam's Faves. Guardian 1000 Must See (2007). Recommended. 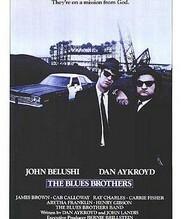 Dan Aykroyd and John Belushi are on a "Mission From God" to raise money for their old orphanage. They set off to get the band back together - no mean feat - and stage a fund raising gig. An all time GREAT CULT music comedy with a mean sound track (+ 20 mins never seen before). Essential viewing.